Someone I know commented that the CA state lottery is a tax on people that are bad at math. 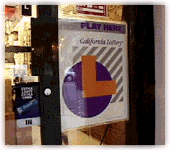 Now for those of you who don’t know the ‘return-on-investment’ of the CA MegaMillions lottery, i.e. spend vs. return based on odds, here’s some stats: The edge that CA lottery (roughly -59%) has on players is more than 40x worse than a Vegas craps table. (-.7%) In other words, if for every $1 you spend on the lottery, you will make a little less than 40 cents, while for every $1 you spend on Vegas craps, you’ll make 99.3 cents. Now that was MegaMillions odds. If we’re talking about the new Powerball odds. MegaMillions is roughly -59%. Powerball is about -69%: i.e. CA Powerball returns are 10% worse than MegaMillions. That’s right: If it wasn’t already bade enough, it just got WORSE. ABC: California Powerball: What are your odds of winning? Imagine millions of a family of 4 living under the poverty line, buying just a single $1 ticket every day at the highest poverty threshold income of $23,000. This is the equivalent of spending ~1.5% of their income annually on lottery tickets and having only a ~30% return. That means 1.0% of every daily Powerball player’s income is spent on the lottery. I’d love to know what the demographic breakdown is of where the lottery gets its money from, per dollar. You are currently browsing the Kurt's Thoughts blog archives for July, 2013.